Unless you know a LOT about horses, the title of this blog post is going to be confusing. Four days ago, I wouldn’t have a clue what that was. Why do I know now? Because I think my horse has this rare disease. I won’t bore you with details, unless you found this page looking for information. Then I’ll give you a summary: Coronary Band Dystrophy is a rare auto-immune disorder that attacks the horse’s coronary band, chestnuts and ergots. 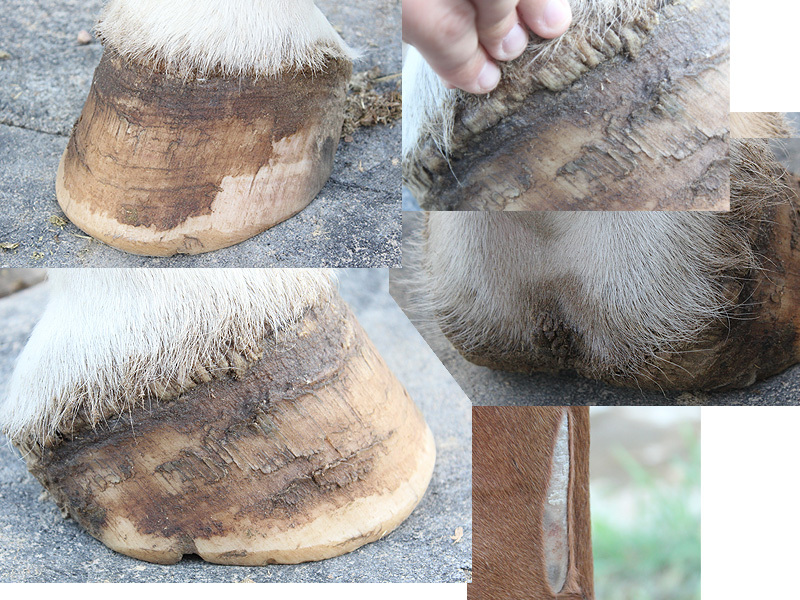 The horse has hyperkeratosis growths on his cornary band and heel, and the hoof wall grows in improperly. That’s.. about.. all.. I know. I’m waiting for the vet to come out and confirm this, as well as try to figure out the best treatment plan. This disease has no cure, so I’m really worried. It seems like some horses deal with it well and you treat the symptoms and they go on with life as planned, while some horses become so crippled that they have to be put down. I’ll be devastated if Spoon has to be put down. I’m hoping this is something we caught early enough to control, but right now I really don’t have any answers so I’m just fretting about it. Sitting at home alone fretting about it, because Tim is on a work trip. Back to my regularly scheduled blog soon, but right now I’m just worried about my pony. hi lauren, I’m from cornwall in uk and my horse has the same thing. he also has equine metabolic syndrome. its all linked to the auto -immune problems. I’ve been able to control the weight issue, firstly through metformin drugs and now a very strict feeding regime but the coronet band dystrophy is still a problem. I have an appointment with a vet who seems to have alot of knowledge about this, on the 14th May. Its very frustrating. My horse was diagnosed with this Aug 2010. I have been feeding her GWF Immune Aid for Horses and her coronet bands have improved greatly. My farrier recommended this as it is suitable for skin conditions and he has other customers who have success with this product. Pemphigus Expressed as Coronary Dystrophy IS an Auto-Immune Condition. Small lesions are treated with a topical immunomodulator. Extensive lesions are treated with an oral systemic immunomodulator. Pemphigus Expressed as Coronary Dystrophy is a mystifying disease. However it is easy to treat and eliminate. A note to mac.barksdale@yahoo.com will get you more data and info. Mystifying dzz but easy to treat ! !